The Council met with the Airport Board to discuss the Airport Master Plan, how the airport is doing, and visions for the future. Council Members also wanted to know how they could be supportive of the Board's efforts. Paul Duerden, Covey Center Manager, was asked to offer the opening prayer for the meeting. Afterward, he presented some information on how the Covey Center is doing and the variety of activities happening there. Over 160 performances were staged in the last fiscal year. The building hosts performing groups, concerts, theatrical productions, art displays, classes, and workshops. Community partnerships are being developed that are mutually beneficial to local performing groups and to Provo City. The Covey Center is also able to attract acts and shows that would normally be at large arenas like the Maverik Center or Energy Solutions Arena. Discussed potential amendments to the development agreement for the Arbors on the Avenue development. Discussed the Housing and Urban Development (HUD) 1-Year Action Plan and 5-Year Consolidated Plan. This will be heard formally at a future Council Meeting. Discussed reprogramming HOME Investment and Partnerships Program funds. This was also heard formally at the July 21 Council Meeting. Discussed amendment to an interlocal agreement authorizing Provo City to become a member of the Jordan River-Farmington Bay Water Quality Council. This was also heard formally at the July 21 Council Meeting. Discussed a request for a zone change from Residential Conservation to Medium Density Residential in the Franklin Neighborhood. This will be formally heard at the August 18 Council Meeting. 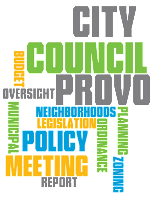 Council Members passed a resolution appointing election poll workers and designating polling places for the upcoming primary and general elections in Provo. 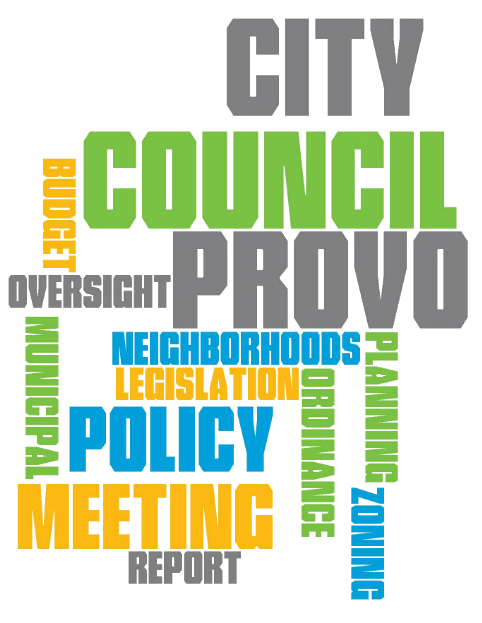 During the public comments portion of the meeting a Provo resident mentioned that she was having trouble finding information about the upcoming elections. Primary elections will be held on August 11, 2015, from 7:00 am to 8:00 pm. Early voting for the primary is available at the Provo Recreation Center from July 28 through July 31 and August 3 through August 7 (hours vary by day). More information can be found on the Mayor's blog. Had a presentation by the Covey Center for the Arts on their production of "Mary Poppins"
Held a public hearing and approved the annexation of property and disconnection of other property along the Provo and Orem city boundary in the Lakeview North Neighborhood. An interlocal agreement on this was also passed.